A classic story of a kid coping with moving to a new school ... IN SPAAAACE!!! Because having a hugely popular webcomic, an online TV show, an immense expo, and a series of videogames tied to the Penny Arcade brand just isn't cutting it anymore, there's now going to be a big-budget, Hollywood movie based on a Penny Arcade strip. On Thursday, Paramount Pictures announced that it had acquired the rights to make an animated adaptation of the Penny Arcade one-off comic The New Kid, which was made back in October. 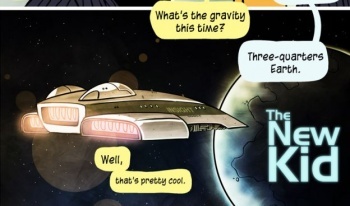 Instead of featuring the usual line-up of Tycho and Gabe, the comic centered around a boy and his father talking about how they are constantly forced to move from planet to planet by his father's job, making the boy a constant new kid at school. According to The Hollywood Reporter, Paramount will be tapping Book of Eli writer (and Gears of War, Star Trek, Futurama, and Duke Nukem Forever contributor) Gary Whitta to write the script for the movie, which will be Paramount's second non-Dreamworks animated film. No other information is yet available on the film, and it's no wonder; the entire plot so far is that there's a kid and his dad going to a planet where the kid will be the only human at school. Honestly, while Penny Arcade is great, this just seems to be a symptom of Hollywood's "If it's not already a book/comic/TV show/older movie then we won't make it" disease. The idea of a human kid going to an alien school (and, I assume, hijinks ensuing) isn't exactly a new idea, and the existing material is so small that calling any film longer than 2 minutes an "adaptation" of it is really pushing the limits of the meaning of the word. I'm not trying to take away from the (admittedly pretty awesome) fact that a Penny Arcade strip is being made into a movie, but it seems like Paramount might just be looking for an excuse to slap the words "Based on ... " onto everything it makes.